Lateral pterygoid muscle is a small, thick conical muscle that has backwards directed tip. From the roof and medial wall of the fossa to the neck of the mandible, it travels backwards and slightly lateral. The upper smaller head emerges from the infratemporal surface as well as crest of the greater wing of the sphenoid bone. The lower larger head emerges from the lateral side of the lateral pterygoid plate of the sphenoid bone. Pterygoid fovea anterior towards the neck of the mandible. Articular disc as well as capsule of the temporomandibular joint. A branch of anterior division of the mandibular nerve supplies the lateral pterygoid. By drawing forward the condylar processes of the mandible as well as the articular discs of the temporomandibular joints, lateral pterygoid muscles of two sides lower the mandible i.e. open the mouth. 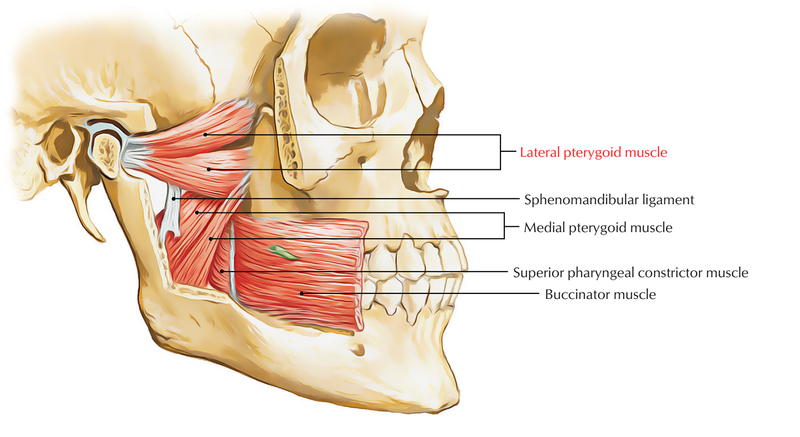 By operating together, lateral and medial pterygoid muscles of two sides protrude the mandible. In order to create side-to-side motion of the lower jaw similar to in chewing lateral and medial pterygoid muscles of the two sides constrict consecutively. The lower head of lateral pterygoid travels in the middle of the two heads of the medial pterygoid muscle. Lateral pterygoid is the only masticatory muscle, which opens the mouth. Developmentally, the articular disc of temporomandibular joint is a part of tendon of lateral pterygoid muscle. Due to its relations give a reasonable knowledge about the arrangement of structures in this zone, the lateral pterygoid is considered to be the main muscle of the infratemporal zone. Superficial head of medial pterygoid. Maxillary artery along with its temporal and masseteric branches. Deep head of medial pterygoid muscle. Inferior alveolar nerve and artery. Middle meningeal artery (deep towards the lower border). Maxillary artery enters the gap in order to connect with the pterygopalatine fossa via pterygomaxillary fissure. Buccal nerve which is a branch of mandibular nerve. It emerges via the aperture in order to supply sensory innervation towards the skin along with mucus membrane of the cheek.